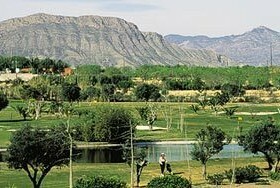 The Altorreal Golf Club is situated inland, about 10 kilometres from the beautiful city of Murcia. The golf course was designed by one of the most important international specialists: Dave Thomas. 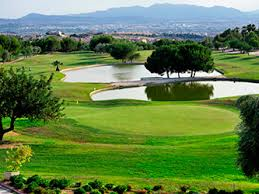 Situated on the edge of the “Molina de Segura”, Altorreal is characterized by a combination of hilly and flat holes in a breathtaking mountain scenery. More than 20,000 olive, pain and carob trees complete the picture. Altorreal is suitable for both novice and experienced players. The greatest challenge lies in the various water obstacles and the well-protected and uneven greens. Precision is therefore important for a good result. The 6th hole is the longest and, with a dogleg to the left, undoubtedly the most difficult one. The ponds on the 9th and 18th hole require extra concentration for a good result. 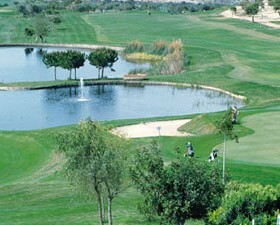 Location: Altorreal Golf Course is situated half way between Alicante and La Manga. 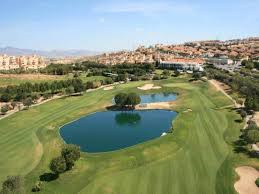 It is 10 km northwest of the city of Murcia and 40 minutes drive from Alicante airport.